Most planning organizations approach and plan every forecasting combination the same way—by trying to tackle each combination every planning cycle. Most of the time demand planners can’t get to every combination each cycle, leading to many going unviewed and reforecasted. Truth is, not every item and customer is equally important. Some customers are more important, some items are more profitable, and some SKUs have higher inventory carrying costs. Additionally, some combinations are easier to forecast than others; while others are much more difficult to plan. So, why do we try to plan everything the same way? Well, we don’t have to. What if we had different strategies for different types of products based on their variability, revenue, profitability or volume? Using ABC/XYZ segmentation allows us to separate combinations into groups which have similar historical patterns, volume and/or revenue. We can then utilize different strategies for planning those groups each cycle. Typically, analysis for ABC groupings are based on historical volumes. Meaning items that have the highest sales volumes compared to those that have lower volumes. We usually consider those with higher volumes more important to the business because we sell more of them and require more supply chain attention. Let’s look at the sales volumes for all items over the last 12 months and rank them based on volume. You can set thresholds to determine, for example, which items make up the top 70% of your historical sales volume. Usually that is a smaller subset of SKUs. Then, look at which items make up the next 20% of your volume the last 12 months. This list is usually much larger. Finally, which items make up the bottom 10% of your volume. You could do the same using sales revenue or profitability, ranking the items by sales dollars or revenue. Based on selling price, sometimes the items with higher historical sales revenue aren’t the same as the volume items. XYZ analysis is based upon the variability of your historical demand, or the variability of your forecast error. These are two different methodologies for determining variability. We’ll start with the first—variability of your demand. Some items are more stable and consistent, and these are typically easier to forecast because the pattern doesn’t fluctuate. Some items have random sales activity and/or are very seasonal in nature. Seasonal items are often easier to forecast if the sales pattern repeats each season. To determine an item’s variability you can use a formula called Coefficient of Variation, or CoV. We explained how to calculate CoV in previous blog article titled “How Great Can You Be?”. 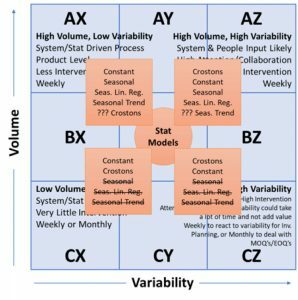 Grouping items based on their variability helps us approach our forecasting strategically. We could also group items based on variability of their forecast error, meaning items that we are better at forecasting versus items that we struggle to forecast. For example, seasonal items have natural variability (their seasons). But let’s say we are good at forecasting that seasonal demand. Our forecast error or forecast variability could be low, whereas our historical variability would be high. Where should you begin? Try starting this XYZ analysis based on volume variability. It’s typically easier to understand the historical variability and apply that to your segmentation approach as you kick off your segmentation journey. You can then further optimize using variability of forecast error once you are more established. These charts show some potential planning process considerations based on volume and variability. For example, your AX (high volume, low variability) items are easier to forecast and as such can be set to “auto pilot” and reforecasted more frequently using statistical forecasting. Little intervention and review is required for these items because they are more stable and easily forecasted. Your AZ items (high volume, high variability) are also very important because of the volume, but harder to forecast given their variability. These will require more attention, more input from sales or marketing, and more frequent reviewing. Given the importance of these items, forecasting these weekly or biweekly would be ideal. We often find ourselves spending as much (or more) time forecasting C items, especially CY and CZ. Why? Because their volumes are low and sporadic. It’s hard to determine when the customer is going to purchase these. A different approach could be to also put these on “auto pilot” and let the system drive the forecast statistically. It’s hard to justify the need to spend a lot of time forecasting an item that we know we will get wrong. We can allow the system to determine the forecast volume and timing using a Croston’s, Average or Single Exponentially Smoothing modeling algorithm. So what do we learn from these discussions? Let’s recap the outcome from our examinations. Understanding the volume of your items helps you understand which are most important from a volume or revenue standpoint. It allows us to classify these as A, B or C.
Understanding the variability of your data will help you apply the best algorithms and periods of history to optimize the statistical forecast output. 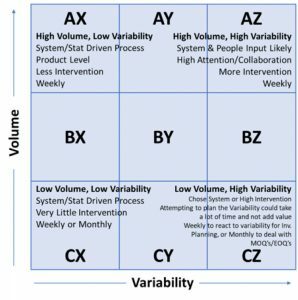 Understanding both the volume and variability of your business and products will help you “design” the best forecasting process and organization. Analysis at the product level will tell you one story about variability. But going to a product/customer or product/customer/location level of detail will add variability and complexity to planning accuracy. Segmenting your planning strategy per cycle will help you optimize your approach and focus first on the items that mean most to your process. By using SAP IBP, you can quickly and easily setup and run this ABC/XYZ segmentation directly in the tool. It is standard functionality in SAP IBP and simply requires you to determine the inputs, thresholds and time horizons. More information about variability can also be found by watching our four-part webinar series titled “Variability Matters”.